So I think – but I am not sure – but I think that I am probably the LAST person to find out that The Body Shop actually has a range for dull skin. 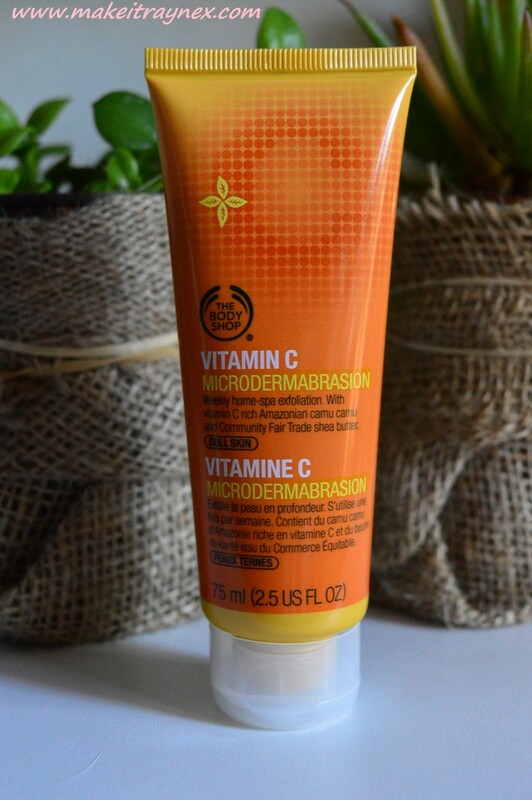 They have a Vitamin C range which is especially suited for dull skin tones. Such as mine. I have mentioned before that I do not have acne or pimples, but that my skin tone is very pasty and dull, and I also have bad undereye circles. I picked this up on the The Body Shop sale which was on in stores and also in Clicks stores country wide. It usually retails for R155 and I got it for R121. Not a huge discount but enough to convince me to just get it. 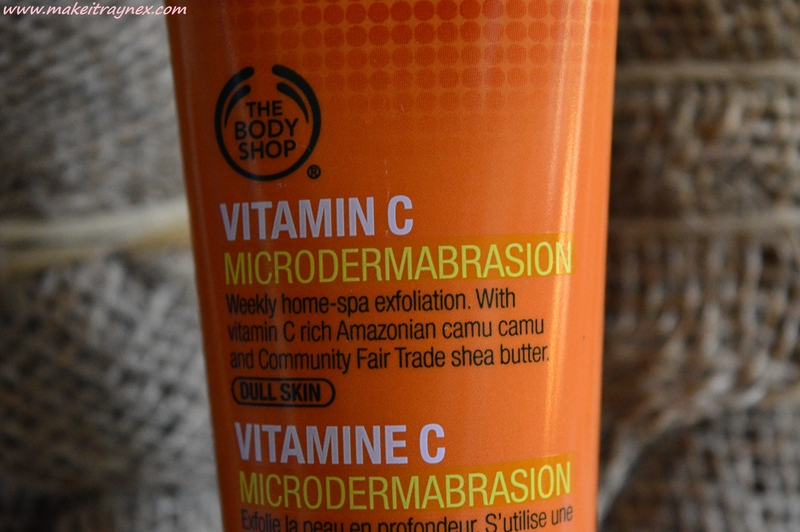 This is how it is advertised on The Body Shop website: Improve skin texture and tone with an affordable spa treatment using the Vitamin C Microdermabrasion. Containing micro-sized garnet exfoliating particles, give skin a thorough and intense weekly exfoliation. Smooth dry, dull skin away for a bright, refreshed complexion! The thing which struck me as interesting was that on the back it clearly states that it is NOT meant to be used more than twice a week. This made me immediately think that it must be a winning product because it has to be used so infrequently. I was super excited to try it. Might my dull skin tone issues all be solved? The application is straightforward enough; apply a small amount to your wet face, rub in circular motions. Rinse face. It was definitely the most grainy skincare item that I have ever used on my face. I LOVE face scrubs though, yet I was a bit shocked at just how grainy it was. It felt like thousands and thousands of small pieces of sand. My face felt different afterwards in the sense that it was firmer and felt almost like it had a thin layer removed (which would make sense). It is microdermabrasion after all. It left the skin a little red from all the grains but it was not sensitive and that is what I had been worrying about. The next day I woke up and I had two pimples on my face. This is weird because, as I said before, I do not get pimples. Then the next day I had two MORE pimples. Two on my hairline, one on my forehead and one on my chin. WARNING: THIS NEXT PART MAY GROSS PEOPLE OUT. They were those small red and painful pimples that you get. And after one day they had completely dried up without me doing anything different to my usual skincare routine. I figure that the microdermabrasion went in so deep that it actually pulled the toxins out of my skin and caused the pimple break out. You can see in the pictures below that it left my cheeks quite red afterwards. Which shows that it really did work at removing the first layer of skin and dead skin cells. I am VERY happy with the results. VERY happy. My skin did look more radiant over the next few days but I was mostly chuffed about the pimples. I know that may sound pretty sad because who wants pimples, right? But it helped get those nasty toxins out of my body and perked my face up a bit. Also, as you can see from the pictures, when they say you only need “a small amount” they are not lying, this was the tiniest squidge and it was enough. Can’t believe its been around long enough that you have used four tubes – and I did not even know about it! I’m now convinced! I need a super deep cleanse, my skin needs some TLC so I think I shall mosey on down to Clicks and get me some! I have so much love for this product but yes, does cause breakouts a day or two after use. I do think that they should make a mention of this on the product so that you use it at least 5 days before an event or something rather than the day before! This product sounds amazing! I really want to give it a try but I am a bit scared about the breakout situation. Vitamin C Microdermabrasion by The Body Shop – Treat skin to a spa-inspired exfoliating facial once a week with our new and improved Microdermabrasion. ← Previous Post: LIFE UPDATE!